Home -> daughter school -> work: 40km. 90 minutes. No heater usually because the car pre-heats while plugged in. All driving is suburban with max 80km/h speed limits. I almost always drive in "D" as I don't like the slow accelerator response in "ECO". I usually arrive home with about 30km on the GOM (guess-o-meter). I feel using the heater on the way home reduces the potential range by 10-15km. I only charge at home as I have no charging at work. Saturday typically 120km but this is broken into two 60km round trips with a top-up between them. Last edited by leighf on Wed, 12 Jun 2013, 12:03, edited 1 time in total. Decided to take the Leaf for a run to Mt. Wilson. Only 63km one way, my first real trip in it. Didn't even bother to reset the trip meter although I did do an over night recharge. Unfortunately Mt. Wilson is also 1740m higher! By the time I got there range was down from 170km to 30km! Not a good look when it's 63km back home. Most of the way back downhill range was less than distance remaining, I made a mental note to never leave home again without the EVSE. At 17 km range she-who-must-be-obeyed (turn right, turn right NOW, the Leaf NavBitch is very assertive) was giving warnings and the range digits began flashing. By Bilpin range & distance remaining finally matched & I got in with 9km to spare. Range Anxiety? Pffft! Last edited by PlanB on Wed, 02 Oct 2013, 14:00, edited 1 time in total. Difference = 170 - 30 = 140km used, 16.5kwh/140km = 118Wh/km this figure makes no sense at all, it must be an artifact. Seems the range prediction is based on rate of power consumption. I figure 24-16.5 = 7.5kwh left in the battery at Mt. Wilson. The 30km prediction there assumes 7.5/30 = 250wh/km. 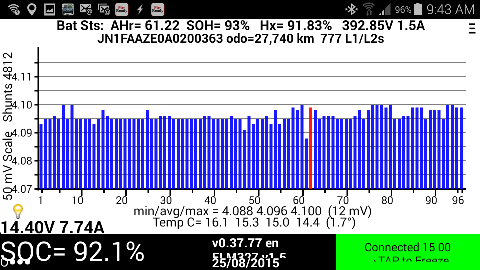 My actual power consumption going up 16.5/63 = 262 Wh/km, 5% agreement good enough. Conclusion: I need a phone app that takes vertical displacement into account, the guess-o-meter is not quite smart enough. After 9 weeks driving Nissan LEAF- I am getting 95 to 115km on 80% - hot weather with air con appreciated, highway runs of 10km @ 100kph and 10km @80kph giving lower range. Last edited by photomac on Mon, 20 Jan 2014, 04:00, edited 1 time in total. My Leaf now has 15,000 km on the clock and is fantastic for my daily commute - 40 km each way plus side trips then charged off-peak each night. Typically has 40 to 60 km left representing range of 140 km. The commute includes 18 km each way on the Eastern Freeway at 100 kph. (106 kph on the speedo). If I slow down to 80 kph on the freeway (eg in traffic) then I could get an extra 10 km range each way. ie. Probably 160 km range total. Lights do not appear to make any difference to range but A/C can reduce range by up to 10 km or more in a blizzard with demister & windscreen wipers going. The "Guess-O-Meter" actually seems to work well provided you take into account that it assumes you are going to continue driving similarly to the last 10 km or so. ie. 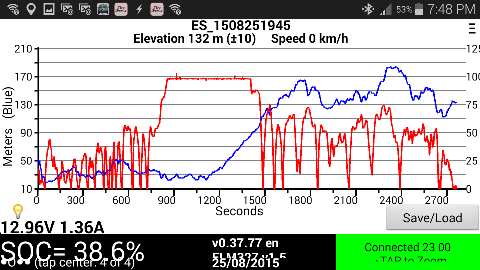 if you are going fast up-hill it will give you a lower range estimate compared with moderate speed down-hill. 15months old with 21000km on the clock. Note, LEAF speedo is about 7-10% error so if it reads 88kph I assume I am doing 80kph. I didn't exceed 90kph ( 81kph) and had 12km left on GOM, no air conditioning. required trickle charging until lights go out. Repeated driving fast recharging did raise battery temperature, and it's only been 17C so a summer's drive in 40C could be problematic. I don't know how far below "0" on the GOM I can go. I used the Old Coast Road and through Australind to minimise impedance on fast traffic. or not as techno as i-MiEV owners seem to be. Volt owners may not worry about EV range cos they have petrol. Can't wait for the new forum software. Last edited by g4qber on Tue, 18 Aug 2015, 09:51, edited 1 time in total. Last edited by photomac on Tue, 18 Aug 2015, 10:09, edited 1 time in total. From fully charged to warning low batt, only managed to get 100km (12km left on guess-o-meter). 60 out of 100km were done on Roe Hwy at 100kph (speedometer reading). 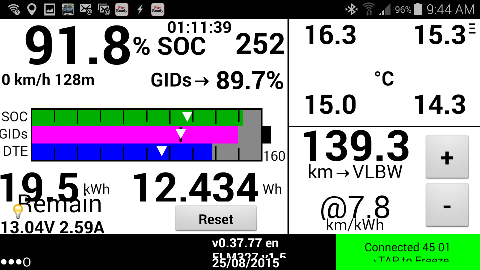 PS: During normal suburb run (no 100kph), I manage to get around 120-ish km (0.13kWh/km). Last edited by Rusdy on Tue, 18 Aug 2015, 13:47, edited 1 time in total. I am learning the LEAFspy Pro too. I noticed the SOC and a few others lock up during journey. I think there are some bugs to fix in the Apple iOS version. All these experience help paint a very realistic range knowledge which reduces risk of possible disappointment. When heading down from home (South Perth/Vic Park border) to Mandurah I hop on the Freeway at the Mill Point entrance. I think the SOC may be affected by the limit the user sets. 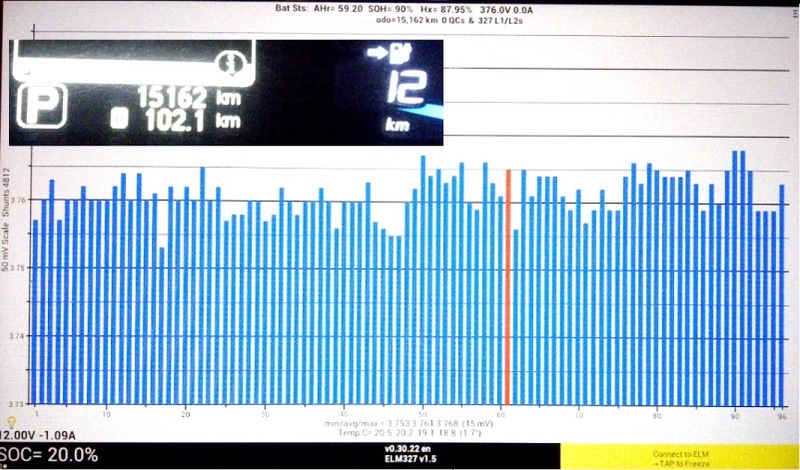 From those figures I used 52.3% SOC for 72km. 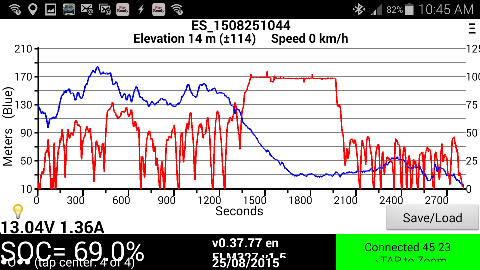 That's 1.37km / 1%SOC suggesting another 53km left! A potential total of 125km at highway speed. Scary so I may try the Mandurah - Bunbury run alone. Luckily for me I have a brother with a power point in Australind some 14km closer than Bunbury. Did you charge to max range mode 100% photo mac n rusdy? Last edited by g4qber on Wed, 19 Aug 2015, 15:49, edited 1 time in total. hi g4qber, from my experiment, my Leaf can't be charged all the way to 100%. 90-ish % seems the maximum. Good idea tho', me think. Regarding bottom limit, I don't have the guts to try it. Don't want to kill the battery anyway . However, from my experiment above, looks like the warning starts at 20-ish% SOC. Imiev don't use all of the 16kwh. 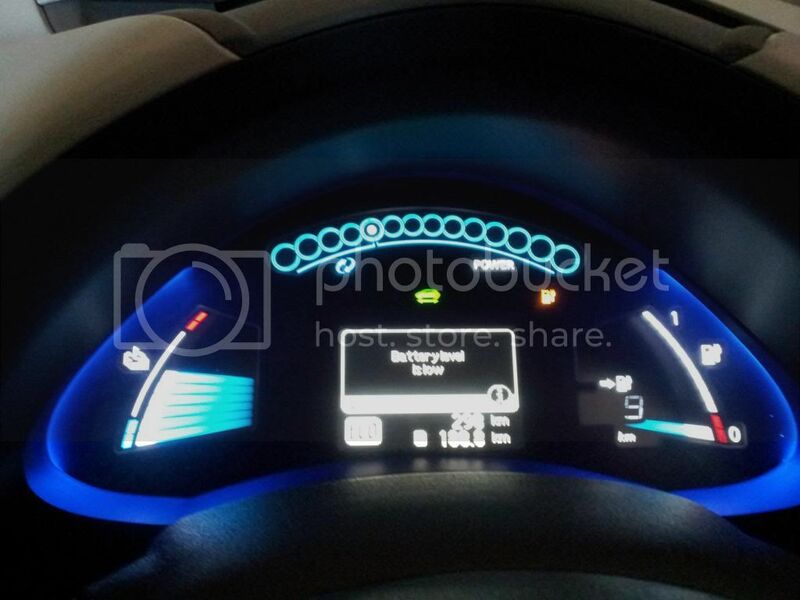 14.2 kWh usable on Imiev ? Since my post at 15K, I started running LeafSpy Pro at 18526km. State-Of-Health (SOH) was then 96%. 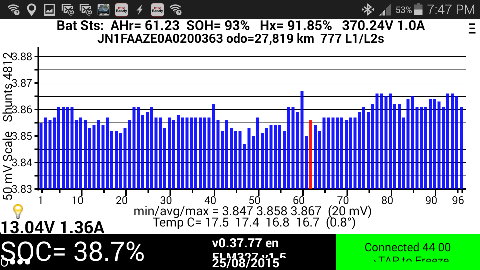 Now at 27779km SOH is 93%. Range has dropped about 15km - still good for my daily commute - typical 40km to work & 40km back home as per screenshots below. EVTech - it is a great video! Last edited by rhills on Sun, 30 Aug 2015, 11:44, edited 1 time in total. lesmando wrote: Lost the 4th capacity bar and get about 90 - 100km on a full charge. Ouch! As if Nissan had predicted this to happen at exactly 100,000km and adjust the warranty accordingly!! Last edited by Rusdy on Mon, 25 Jul 2016, 06:40, edited 1 time in total. Had my Leaf for a week. 22,000km on the clock LeafSpy reports 85% SOH. After 1 week the SOH has dropped to 83%, don't know if I was duped or if this is just something with the car. I expected ~85% SOH given the 4yr old car and 22,000km, but drop in SOH has me a little concerned. Used the Nissan Leaf Range Estimator app and it seemed reasonably accurate. After 4 months of ownership, the vehicle has done 25,562km, here are some stats about my range. Note the values represent Wall to Wheels consumption, the Leaf can only show Battery to Wheels consumptions, so while my Kw/Km is 0.197, the Leaf shows it is 0.15 on the Dashboard display. I'm only really interested to know what it is costing me to operate the vehicle, anything else is meaningless to me. The average Kw/Km or Km/Kw gives a reasonably accurate expectation of range, with the obvious issues that hills, speed, wind, A/C affect the range per trip. 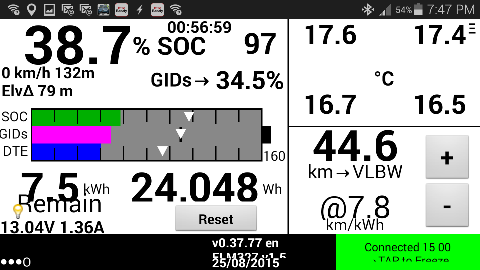 Basically I work on 1Km/1% SoC and that seems to work well for the driving I do. 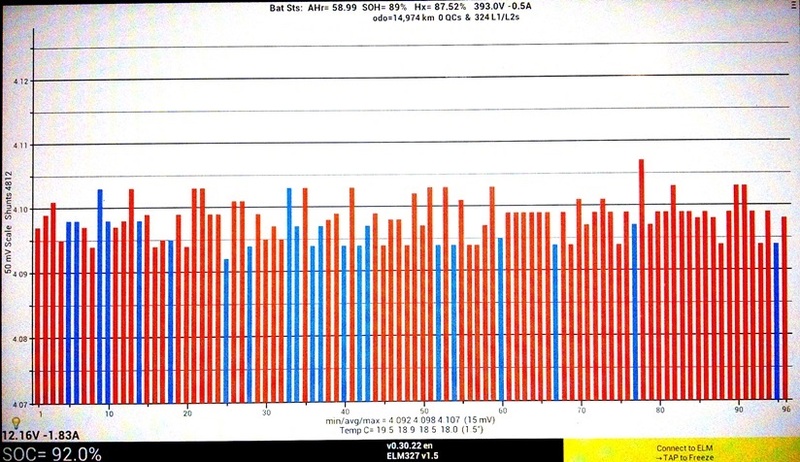 My LeafSpy shows the best SoC I can get is about 93%, so realistically I am saying I can go 93Km. I'm not getting anywhere near the 120-150km range that others are saying they can get, and it is interesting that the EPA (US) is 86mi, which would translate to about 136km, so with 82% SoH I would expect about 110Km range. The spike is when I took the Leaf for the service. Ok, so what are Nissan service doing that causes the SoH, Hx and AH to change? Interesting after the SoH was bumped back up above 85% there was still 1 bar missing in the cars representation of SoH, so it still knew SoH was less than 85%. Hx has not come back to where it was prior to the service, no idea what that value really means, but is a bit of a concern. I saw this behaviour when I purchased the car, and I suspect that it was serviced just before I bought it, which would be consistent with what I am seeing now. For my around town needs this car is perfect, but any trip of significant range is a problem as we have almost no charging infrastructure in Australia, and using the EVSE is a joke given they put the 15A plug on it, besides the very long time it would take to recharge anyway. 15A EVSE takes a few hours and is Ok, but there needs to be many more of them before it is a reality for any sort of longer range driving. Last edited by KiegKhan on Sat, 26 Nov 2016, 04:23, edited 1 time in total.